The Coalition seeks to privatise and fragment the NHS – perhaps Labour’s greatest achievement which, it should never be forgotten, the Tories opposed from the outset. Despite huge public anger at Coalition attacks on the NHS, this government-without-mandate thinks it can get away with allowing NHS Trusts to go bankrupt, deliberate lengthening of waits for NHS patients, outright privatisation of hospitals and the selling-off of NHS services, such as the blood service. Nurses, doctors and NHS cleaners are being cut, while Tory donors are making millions in profits from providing agency staff to the NHS. This Tory attack on the NHS is not about cost-saving or efficiency, but about ideology – opening up another part of our society to profit. To preserve the high-quality NHS that the vast majority of people support, we must hold Labour to its national promise to repeal Tory Lansley’s destructive Health & Social Care Act. We must also organise to ensure that Labour ditches Blair’s dangerously misguided policies, like PFI-funding and Foundation hospitals, which opened the door to the Tories full-scale healthcare privatisation plan. But the NHS is under attack now and we cannot wait for an election to save it. To hear what we can all do now in defence of our NHS, come to the next meeting of Brighton & Hove LRC from 7.30-9.30pm, Thursday 16 August at the Lord Nelson pub, Trafalgar Street, Brighton. Speakers have been invited from the NHS Support Federation and Keep Our NHS Public. No future government must feel safe to attack the NHS in the way this Tory-led Coalition has. 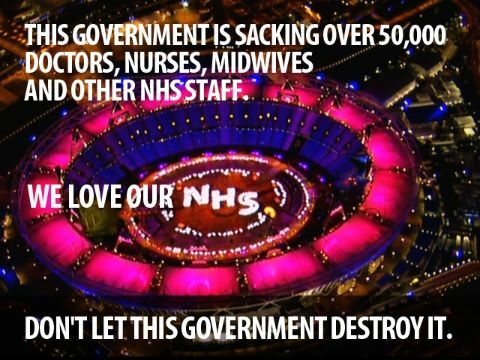 We must unite now to defend our NHS and those who work for the good of us all within it.